Got here. Eventually. To a”printshop” the word used more often than not in the local (North American) parlance. This one is the Lower East Side Printshop. 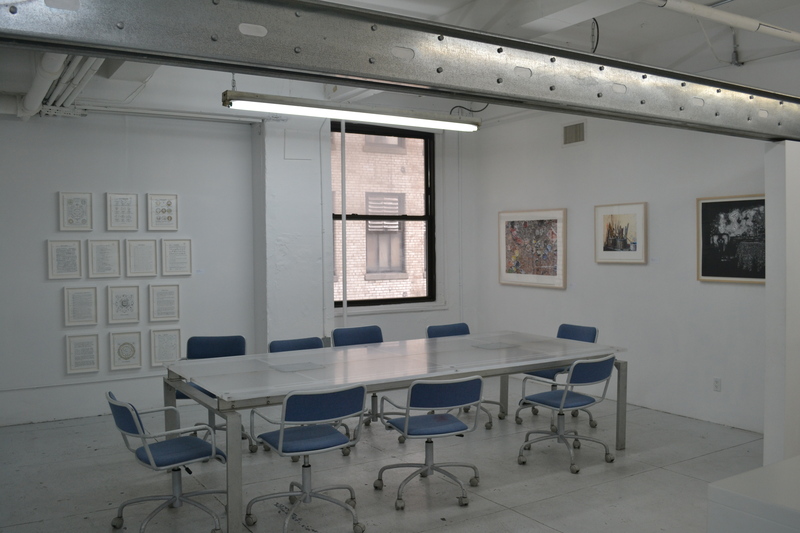 Also in NYC there’s The Robert Blackburn Printmaking Studio -the exception that proves the rule? In Australia we usually say “printmaking studio”, rather than printshop. Or if you’re in a French speaking part of the world, just let “atelier d’estampe” roll off your tongue. 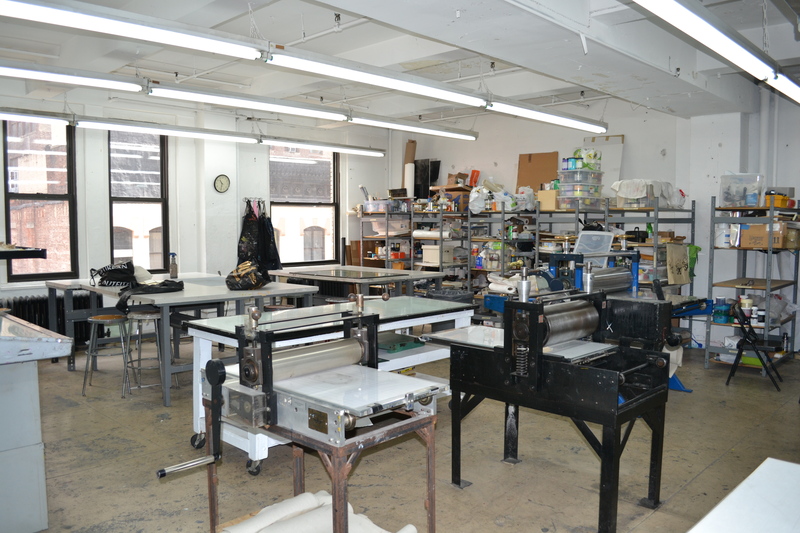 The Lower East Side Printshop, is no longer on the lower east side, having outgrown the original premises in 2005. Like the other places I visited it’s in a non-descript building up a few floors, but it’s a clean, light-filled welcoming space. There were only a couple of people working there when I was shown around by the incredibly helpful Christine. She filled me in on what the printshop offers – 24/7 studio access, classes at all levels, residencies (- available to legal US residents), master printing and of course details for all of these services are available on the website. Apart from the etching presses, silk screen printing area (and areas for processing plates and screens of course) and digital facilities (complete list of facilities? : yes on the website), there is also an exhibition space. “Collaborations” a selection of work done by artists working with the master printers in the Special Edition or Publishing Residency programs. Pictured L-R: William Powhida, Ars Magica, 2010, screenprint, portfolio of 13,(I loved the humour of this work) Joe Fig, Inka’s floor, 2008, screenprint, Joe Fig, Brushes (Bill Jensen), 2008, screenprint, (stunning use of colour in these prints about the mess and well, colour of the painting process) and Sebastiaan Bremer, Little Silver Breakfast, 2008, silver leaf (loved, loved this! Technically intriguing and beautiful -more about this work in a future post). You can see these and more artists works on the website, biographical details about the artists and purchase work through the online store. Other artists in this show were Emilio Perez, Havard Homstevdt, Joan Lindner and Amy Cutler. 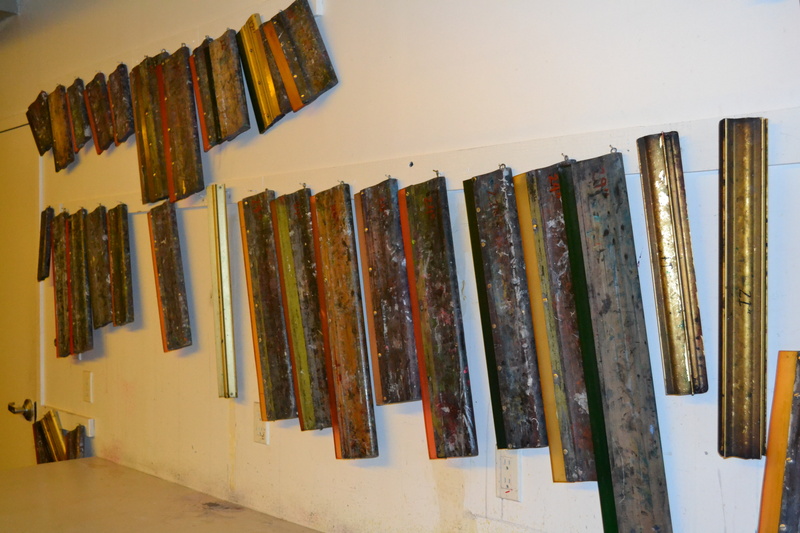 Each artist has used different techniques in their work – evidence of the breadth of technical knowledge available to artists working in these programs. I would love to come back and do some work here… maybe when I find a patron or win the lottery! It’s just a bit far from home for me, but if you’re in NYC I’d recommend doing some printing here!